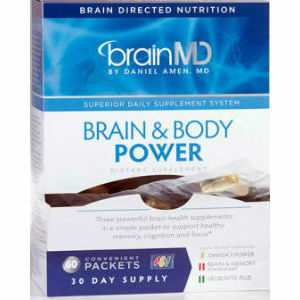 This is a review of BrainMD Health’s Brain and Body Power Review. The manufacturer states that this product is meant to give a person the ultimate brain performance and health while also providing a boost to the entire body as well. When you buy the product, you receive a formula of vitamins, that would be more expensive if you purchased them all seperately. The formula also provides you with the correct amount of the necessary ingredients to improve overall cognitive function and health. Keep reading this review if you are interested in learning more about this product and whether or not it lives up to its claims. Each supplement’s ingredients included in the packet are listed below. Other ingredients include: Hydroxypropyl methylcellulose, rice flour, silicon dioxide, and stearic acid. This product does not contain any dairy, artificial flavoring or coloring. Other ingredients include: Vegetable Cellulose, magnesium stearate, microcrystalline cellulose, and silicon dioxide. It is recommended you take two packets on a daily basis. Each packet contains five capsules. It is best to take these supplements with meals unless otherwise directed by your doctor. While the company does not specifically state that the supplement causes side effects, we always suggest you should err on the side of caution when it comes to taking any new supplement. Always speak with your physician first before taking any new dietary supplement, especially if you are a woman who is currently pregnant or nursing, a person taking prescription medications, or someone who has an existing medical condition. If you notice any unusual side effects while taking this product, immediately discontinue use and get in contact with your doctor. The price of this product for a one time order is $99.95. If you decide to do a monthly auto subscription, you will save 15 percent from the original price and pay $84.96. One box will give you 60 packets which will equate to a 30 day supply. The company states it has a customer satisfaction guarantee though we could not find specific information on the product. All it states is “satisfaction guaranteed or your money back.” We believe you would need to contact the company for further information. This product has garnered very positive reviews from users on the site. There are more than a handful and all have stated that they noticed a difference when taking this product. BrainMD Health’s Brain and Body Power gives the customer the ease and convenience of taking all the necessary supplements to boost and support brain functionality in one convienient packet. It comes with a customer guarantee and also the option to auto renew on a monthly basis. However, it is a bit pricey and the customers will have to pay for the convenience of these parceled out packets. The price for this box can and will be the determining factor for many new customers. Henry Costa	reviewed BrainMD Health Brain and Body Power	on November 20th	 and gave it a rating of 3.